The Sun will rise became among top of the world in this month Songlines magazin . Unlike many world music projects, which to varying degrees of success integrate disparate styles of instrumental and melodic practice, here the purity of expression is paramount. Wie anzunehmen ist, sind diese 51 Minuten eine sehr spirituelle Reise in nahöstliches Gefühlsleben und getragen von sehr viel Anmut und voll von Geheimnissen und Mysterien. None of the 21 tracks reaches even four minutes length, but that is hard to belive, such is the transporting power of her unaccompanied voice. 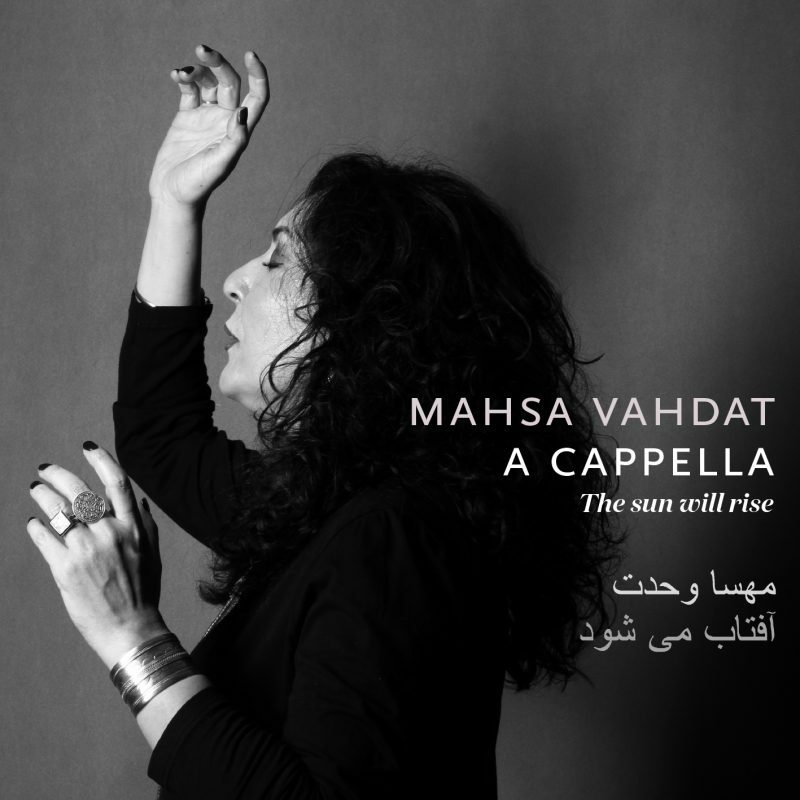 Mahsa Vahdat’s stunning voice has caught international attention. She has over the last 10 years released 7 albums, some together with the sister Marjan and some with other artists. Her latest solo album “Traces of an Old Vinyard” has recently been chosen by the magazine Songlines as one of the best albums of 2015. In April 2016 she releases her new a cappella album “The sun will rise” with 21 songs performed by her solo voice only. Most of the songs are Mahsa’s own melodies composed to traditional and contemporary Persian poetry. The record is a pilgrimage to a beauty marked by stains of love and dreams. In old churches, castles and halls – in Van, Istanbul, Oslo, Wroclaw, Provence and Alhambra, Mahsa’s voice fills rooms of hidden stories and mysteries. Her orchestra is just the echo from walls and vaults, floors and columns in the rooms she and her engineer and producer Erik Hillestad chose for recording. Mahsa found the needed inspiration from unspoken stories and layers of time, expressed through architecture and art, and through the patina left by time and by life itself. She wanted to go to similar places in Iran, but because she is not allowed to perform in public places there, she had to record in other countries. During this journey, Mahsa’s emotional moods would receive suggestions for which songs to sing from the walls, windows and bricks, and even from the scent of the rooms where the recordings took place. In some cases there were also people present in the recording sessions, so it became like a live performance for a limited audience. In other places, the presence of birds, footsteps, bells, distant voices, brooks and fountains became natural elements of the flow of music. She recorded around 50 songs, and 21 of them were selected for the new album. Born in Tehran in 1973, Mahsa Vahdat entered the Art University in Tehran in 1993 and graduated from the Music Faculty with a BA in Music. She took part in the 2004 thought-provoking musical statement “Lullabies from the Axis of Evil.” Freemuse Award Winner 2010. My voice is my homeland. My songs are about freedom, love and longing. My work is to trust the moment and make it eternal. In the most passionate moments of my singing, I fly to the landscape of the Alborz Mountains. Wherever in the world I sing, the rays of their sun interweave with my breath. The painter Emanuel Vigeland’s masterpiece is his own mausoleum in Oslo. Here he has created a barrel-vaulted room with an 800 square meter fresco called “Vita”. The walls and ceiling are covered with motives from human life, from birth to death, reinforced by the unusual and overwhelming acoustics of the room. A beautiful old Gothic church built in the late 14th century, at the time when the Iranian poet Hafez lived in Shiraz. The village of Sigonce is a pictoresque jewel with a relaxed, friendly atmosphere. Som miles north-west of Valencia the small town Requena holds the 14th century Church of Santa Maria with it’s wonderful accustics, Today the building is a concertplace, not unlike the Jakob Church in Oslo, where the recordcompany is located. The Crimea Memorial Church (built 1858-68) is an English church in the Taksim district of Istanbul. Donated by Sultan Abdulmecit, in memory of British soldiers who participated in the Crimean war. Istanbul is Mahsa’s favourite city outside of Iran. In Alhambra, among gardens and fountains you find a former Franciscan monastery, now turned into a hotel. The remains of an old Nasrid palace from the Muslim era have been preserved in the “Nazarí Room” where we did the recording. St Elizabeth’s Church (14th century) is a Gothic church in Wroclaw, an iconic structure of the city’s panorama. Since 1999 there is a memorial on the church property to Dietrich Bonhoeffer, a native of the city and martyr to the anti-Nazi Cause. We did the recording in one of the chapels in the church. Alhambra is an outstanding example of Oriental architechture. We recorded in The Palace of the Lions (14th century), built by Muhammad V. This is a wonderful example of the integration of architecture, gardens and water. We included the sound of the fountains in the recordings. A medieval Armenian cathedral, built in 915, exactly 1000 years before the Armenian genocide. The church is situated on an island in Van Lake. We recorded on a day when the cherry trees around the church bloomed. The snow covered mountains around the lake made a stunning view from the green island. The closest place to Iran we came during the journey of this album.